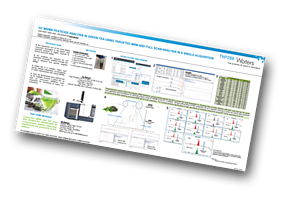 Waters has produced a poster describing GC-MS/MS pesticide analysis in green tea using targeted MRM and full scan analysis in a single acquisition. Tea represents one of the most widely consumed beverages in the world, and pesticide analysis is legally required to ensure consumer safety. GC analyses are required for full pesticides coverage, satisfied through the use of selective and specific targeted MRMs. Green tea is a complex matrix, and during sample preparation co-extractives, or matrix interferences, will impact MRMs. In this poster an easy method setup for targeted analysis of pesticides in green tea is demonstrated. The Xevo TQ-GC has simplified workflows that enable users to produce results that meet regulatory recommendations. The added functionality of RADAR allows full scan and MRM data to be collected simultaneously. This data can be interrogated to identify change to understand extraction interferences at the time of the original analysis, or as part of a retrospective data mining investigation. The combination of MRM and full scan in a single method acquisition does not impact sensitivity and is valuable for use in method optimization.